This Modernist building is now part of Pier 36. 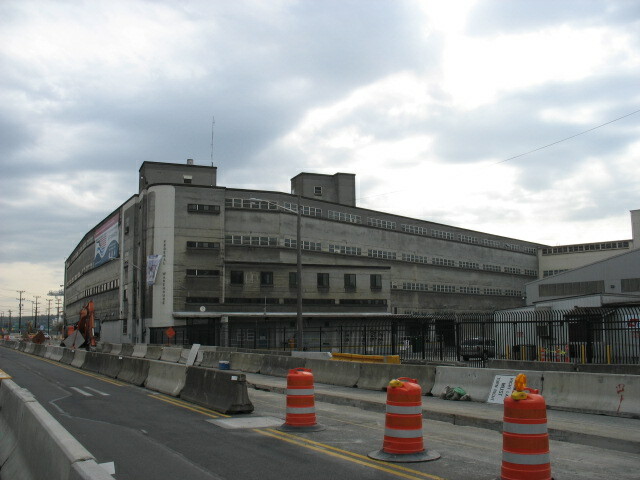 It was built as the U. S. Army Terminal Warehouse between 1940 and 1941 and now is part of the U. S. Coast Guard headquarters. By the late 1970s, the building functioned as a laboratory and ground floor openings had already been altered. Since that time, openings at other levels have been filled in and/or altered. The building is mainly interesting as a significant vestige of the U. S. Army’s presence at Pier 36, beginning in 1940 to the 1960s. Among other functions, the building now serves as a repository for surplus government equipment and seized property. From 1975 to 1995, it housed of the U. S. Customs Patrol and Marine Unit. Also, during the 1980s, the southeast corner of the warehouse began to serve as the St Martin de Porres shelter, run by Catholic Community Services. This building is now part of Pier 36. Irregular in plan, it is a massive, concrete structure, with many banks of windows, not a few of which have been altered or filled in. It is visually prominent. There is a barbed wire fence on its south side. Paul Dorpat, Seattle Waterfront: An Illustrated History, Seattle, June 2005.